The third annual 91X Presents BeerX (Beer • Music • Grub) is set for Saturday, August 12 at San Diego, California's scenic Waterfront Park. The festival will feature top reggae, roots and alternative music artists with headliners Iration, as well as J Boog, Magic!, Chicano Batman, and San Diego's own Trouble In The Wind and Splavender. In addition, BeerX will offer complimentary craft beer tastings, with an extensive craft beer lineup highlighting some of San Diego and Southern California's top breweries, and local food selections. 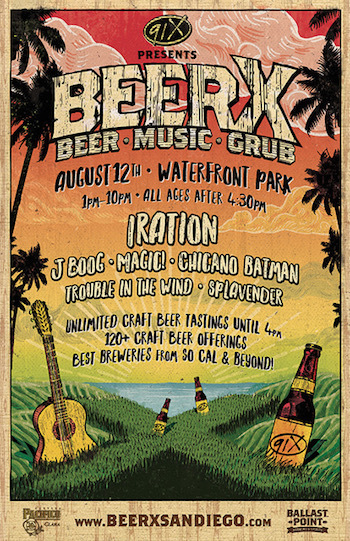 Iration said, "We're stoked to be paired up with two of our favorite things about San Diego…91X and beer! It's going to be a great day of music and beer-sampling in a perfect summer setting. Come out and join us August 12!" 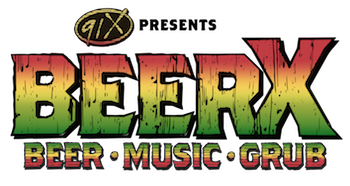 Tickets for 91X Presents BeerX go on sale Friday, June 16 at 10:00 AM PT at www.BeerXSanDiego.com, with a special 91X presale beginning Wednesday, June 14 at 10:00 AM PT. See below for details. Produced by premier music festival production company Synergy Global Entertainment (SGE) and Orange County, California's most successful and respected craft beer festival producer Brew Ha Ha Productions, the festival will feature over 120 craft beers, along with a full day of music. The initial list of breweries includes: Alesmith, Artifex, Beachwood Brewing, Green Flash, Karl Strauss, Lost Abbey, Mikkeller San Diego, Modern Times, Monkey Paw, Noble Ale Works, Stone Brewing, and Track 7 Brewing, with many more to be announced. Cameron Collins, Co-Founder & Director of Events at Brew Ha Ha Productions says, "BeerX is the perfect summer pairing! Some of the best breweries from San Diego, Southern California and beyond, epic reggae artists and tasty grub all set on the beautiful San Diego coastline. I live for this stuff! I can confidently say this will be the BEST BeerX ever!" 91X Music Director and Midday host Hilary proclaims, "BeerX is pure radness! Under the sun, on the grass right next to the ocean, with bands who will bring the perfect vibe…we've put as much energy into curating the music as we have the lineup of breweries that will be there. It really is the perfect San Diego summer festival!" During VIP and early entry tastings (from Noon — 4:00 PM), and general admission tastings (from 1:00 PM — 4:00 PM), 91X Presents BeerX attendees 21+ will enjoy unlimited craft beer samples from top breweries. Local food trucks and pop-up restaurants will also be on site selling a variety of delicious and unique food options throughout the day and evening. Craft beer and other libations will be available for purchase at concession stands as well. All-ages attendees may enter after 4:30 PM with a regularly priced ticket. Music starts at 12:30 PM and ends at 10:00 PM. An extremely limited number of BeerX $45 discounted presale tickets will be available starting Wednesday, June 14 at 10:00 AM PT. Information and presale codes from participating radio stations are available from 91X, Z90, and Magic 92.5. Starting Friday, June 16 at 10:00 AM PT, General Admission and VIP tickets will be available for purchase for the following prices. Note: All tickets for those 21+ include beer tasting, and access to live music. BeerX sponsors include Pacifico, Corona, Ballast Point, and more. Synergy Global Entertainment, Inc. (SGE) is one of the world's premier music festival production companies. With hundreds of live events worldwide each year, SGE works with agencies, brands and musical talent to produce or co-produce concerts across various genres and interests. SGE produces Ohana Dana Point, Funny Or Die's ODDBALL Comedy And Curiosity Festival, and the new ID10T Music Festival & Comic Conival. SGE also co-produces festivals such as It's Not Dead and MUSINK, as well as a number of craft beer & music festivals including Driftwood — Orange County's biggest country festival on the sand, Sabroso Craft Beer, Taco & Music Festival, and Ye Scallywag!. In addition, SGE co-produced the Rockstar Energy Drink Mayhem Festival and the worldwide Rockstar Taste of Chaos, produced the Rockstar Energy UPROAR Festival and conceived and developed KNOTFEST with Slipknot and 5B Artist Management. SGE has also produced many other national festivals and tours. SGE senior staff have a combined 60 years of experience in artist management, large scale festival production and brand integration, and have worked with artists as diverse as Guns N' Roses and The Cure. SGE excels at integrating brands' needs with large scale musical entertainment.